Indecipherable Text converts any sensation of annoyance or indignation into a mild-mannered, dull buzz. It is a two-disk sedative: 16 counselling sessions – each leaving the participant free of qualms or stress. The sounds heard are seductive and insightful and seem ready made to ease a worried mind. Eluvium consists only of Matthew Cooper, a man whose fragile and stunning blend of delicate piano, expressive feedback and lightly strung guitar elicits warmth rarely found in music – particularly music as reserved as this. The consideration that Cooper puts into his composition is evident throughout every second in Indecipherable Text. The gentle piano motifs expertly balanced with the small intricacies that make this album so breathtaking. Put simply, this is ambient music at its best. Indecipherable Text is a compilation of two of Eluvium’s previous albums: his first, Lambent Material, and his third, Talk Amongst Trees, with bonus tracks included. The two albums mesh well, the twin-disc pairing enabling the listener the chance to experience the refreshing, talent-soaked debut, and the developed third album. The 15-minute epic ‘Zerthis Was A Shivering Human Image’ from Lambent Material, is a hair raising experience, the rise and oscillation of the song a result of the willowy static and hum created by guitar, distortion and the vehemence of Cooper. Despite its long length, ‘Zerthis’ leaves the listener waiting for more; the sounds contained within this epic are awe-inspiring. On Talk Amongst The Trees, Cooper has developed and fine-tuned his compositional skill since releasing Lambent Material. Here he is experimenting more with mysterious sounds, created by the use of a looping pedal, reverb pedal, and unusual microphone placement. He has also extended the journey of the recording, the end result lasting over an hour. The elegance of Talk Amongst The Trees is the way in which it sways from the subtle to the grand; the music evoking recollections of clouds lethargically drifting across skyline. ‘Taken’ is the standout track of Indecipherable Text. Running at nigh on 17-minutes, the length of the song is deceptive – the light strokes of guitar emitting peaceful reassurance. Music like the music created by Eluvium is rarely found; the tracks sounding so sincere that they seem incapable of exhaustion. 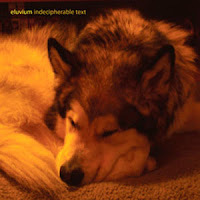 Indecipherable Text is a collection of work that conveys Matthew Cooper as a man betrothed to music; each track drenched in both zeal and attentiveness. The music contained is alluring and stimulating, and first-time listeners run the risk of becoming permanently engrossed in the sounds of Eluvium. In the end, it is an album for anyone who appreciates music. Two works of art have been compiled together to create an album that leaves the listener in awe – and thanking the stars that they had the chance to experience it.